The American Missionary Association (AMA) was an abolitionist group founded on Protestant beliefs. Their focuses were on the abolition of slavery, education for African Americans, gaining racial equality, and promoting Christian values. They were most prominent in the United States before and during the Civil Warand during Reconstruction. The AMA was founded on September 3, 1846 in Albany, New York by disaffected members of the American Home Missionary Society (AHMS) and the American Board of Commissioners for Foreign Missions (ABCFM). The founders were upset that the AHMS and ABCFM failed to take a stand against slavery and accepted contributions from slaveholders. To correct this, one of the first and most important objectives of the American Missionary Association was to abolish slavery. They worked hard to help push the slavery debate onto the national political agenda and founded the American Missionary magazine to better spread their message. As one of the few organizations that believed in racial equality, their leadership was also integrated. The first board of the AMA was made of eight white men and four black men. Before and during the Civil War, the American Missionary Association founded anti-slavery churches and black schools. In Illinois alone, they were able to help start over 115 churches founded on belief that slavery is wrong. The AMA also recruited teachers to help educate black people, which was unpopular at the time. During the Civil War, many AMA teachers instructed freed slaves in so-called contraband camps in Union-controlled Confederate territory. These classes were often filled with a wide range of ages and both genders including adults and children. 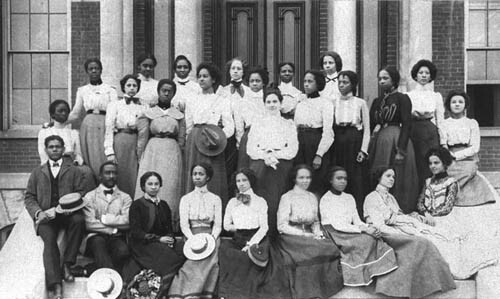 After the Civil War, the American Missionary Association dramatically increased the number of schools and colleges it founded for freed slaves. White sympathizers and previously free black people believed that education should be a top priority for freed slaves and was the best way to help them fully gain their civil rights. With this idea at the core of the AMA beliefs, they founded more than five hundred schools and colleges in the South and spent more money doing so than the U.S. government-sponsored Freedmen’s Bureau. Those colleges included Fisk University, Hampton Institute, Tougaloo College, Atlanta University, Dillard University, Talladega College, and Howard University. The American Missionary Association also created the Freedmen’s Aid Society to recruit Northern teachers to teach in the South and help find those teachers housing. As the Reconstruction Era ended, the American Missionary Association expressed its dissatisfaction with the federal government’s withdrawing of support for the interracial governments in the former Confederate states. While the rest of the country turned its back on civil rights for African Americans, the AMA never ceased in its efforts. While most prominent in the United States before the Civil War and during Reconstruction, the AMA also sponsored missions in other nations. Its strongest efforts outside of the United States were in India, China, and East Asia. It was largely supported by Congregational and Presbyterian Churches. During the 20th century, the AMA saw a decrease in support as its members joined other organizations. Many joined the United Church of Christ (UCC) which eventually absorbed most AMA members. In 1999, the remaining members of the American Missionary Association formally merged with the Justice and Witness Ministries division of the UCC. “Blacks and the American Missionary Association.” United Church of Christ, http://www.ucc.org/about-us_hidden-histories_blacks-and-the-american. Lester Sullivan. “American Missionary Association.” Amistad Research Center, Tulane University, http://amistadresearchcenter.tulane.edu/archon/?p=creators/creator&id=27.